Finally, the time of the year that we were all anticipating has finally arrived. With the summer heat coming into play, it is time to ditch the cold season attire and whip out your finest summer wear. Festival season is perfect to genuinely show your true colours and let your personality shine through. From vibrant colours, to bold patterns, to bringing back the 90’s here is your ultimate guide to festival fashion for the summer of 2018! To kick things off, complete your festival look from your head all the way down to your toes with a pair of combat boots. Versatility comes to ease with these fresh kicks when searching for a way to spice up your look. Complement your combat boots with a dress, pants, shorts or anything that comes to mind, these boots will not fail to add an edge to your attire. If you are looking for something more suitable for the Canadian summer weather, slides are an exceptional choice. This easy slip-on shoe comes in many different styles to suit your mood, whether you are going for the double leather straps for a stylish festival look, or the single strap for a more chilled athleisure look, slides have got you covered. Are you looking for the height without the discomfort? Save your sole and heel the pain with some platform shoes. Just like combat boots, this type of footwear is very versatile. Dress them up or dress them down based on your desired look. Polka dots, florals, stripes, plaids and checkered prints are all sorts of fun patterns to experiment with this summer. A huge trend for girls this season are floral patterned sun dresses. This fun fashion craze is perfect for the festival season as it adds liveliness to your look with little to no effort. 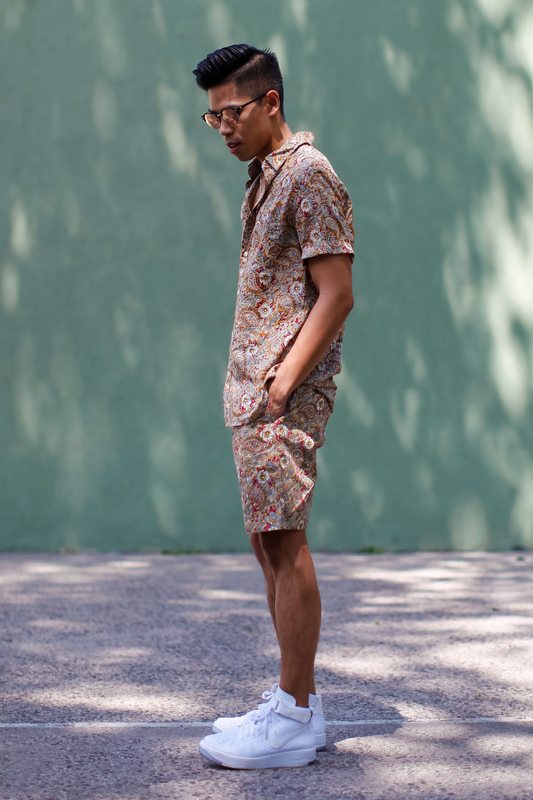 For the men, a tropic print shirt is an ideal go-to because just like the ladies, liveliness is an essential for this sunny season. Ditch the all black attire and make loads of room for some uplifting colours. Yellows and reds are making a substantial appearance in stores this summer, and they sure won’t be hard to miss. Adding bold colours to your wardrobe for this festival season will make your summer complexion pop and completely illuminate your look. Stripes go with everything, including sun and little white chapels. @delfin painted this. his gallery is today. For anyone that is interested in fashion, we all know that old trends often make comebacks. This summer, a chic 70s trend that is making an enormous comeback are matching sets. An easy and flattering ensemble that can be worn separate, but are better together. For all you 90’s babies out there, not to worry we haven’t forgotten about you. 2018 is your time to shine once again. All things 90’s are making a prodigious return, from denim dresses and jumpers, slip dresses, band shirts and anything high-waisted, this trend will most definitely present you with some nostalgic vibes. Adding on to the trendy comebacks, these accessories are a huge must have this festival season. From tiny framed sunglasses, mini backpacks and fanny packs, compact is the way to go! Alternative accessories that are also making a huge return are scrunchies and bucket hats. Beat the heat by keeping a scrunchie around your wrist to tie your hair back when you’re feeling a little toasty, or use a bucket hat to shield yourself from the hot summer sun. Add even more vibrancy to your look with some fun graphic patches that are also a fashionable must-have this summer. Incorporate some patches onto your denim jackets, shorts, skirts and backpacks to add some excitement to your attire.